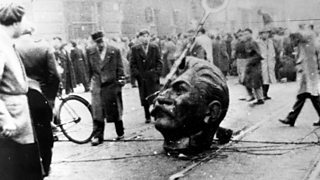 A public uprising in Hungary against the USSR leads to a bloodshed. What caused it? And what was the effect on international relations? In June 1956, the Hungarian people began to protest against Rákosi’s regime, and Moscow replaced him with Ernő Gerő. He was no more popular and on 23 October 1956, students took to the streets and were supported by the workers and the Hungarian army. On 28 October, Soviet tanks began to withdraw and many Hungarians were now confident of American support. This led to more pressure for a series of sweeping reforms. On 1 November, Imre Nagy announced the decision to introduce free elections and to leave the Warsaw Pact. and weaken the defences of the USSR.